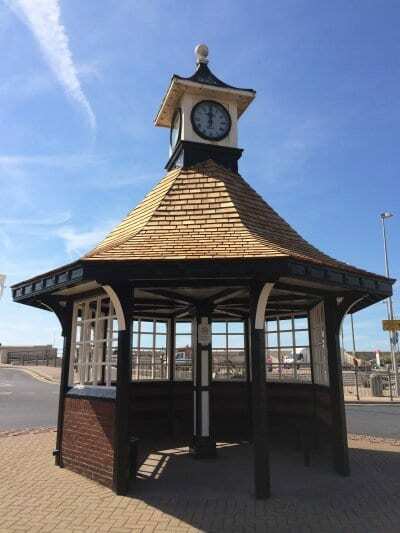 In 2014 Visit Cleveleys led the Save our Clock Shelter Campaign and between us we secured the future of one of the last remaining heritage assets in the town. 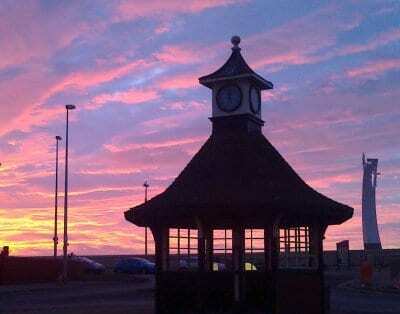 At the end of Victoria Road West, in the roundabout on the promenade, stands the iconic Cleveleys clock shelter. As you can see in these photos, it was in a sorry state after the storms of December 2013 and early 2014. A large number of the wooden shingles had blown off the roof, the paintwork had been eroded by the harsh winds which sandblast it all year round, and the clock which tops it off hasn’t been working for a very long time. 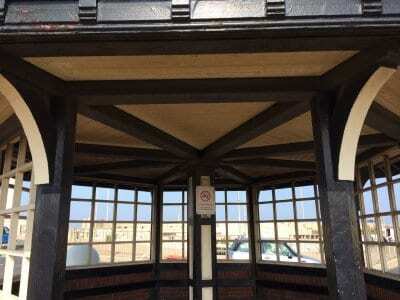 Conversation on Facebook showed that the people of Cleveleys have a strong affection for this little structure and are strongly in favour of it being restored and maintained in it’s current form for generations to come. It’s well used by people sitting awhile, maybe with an ice cream or fish and chips, and it’s obviously a spot that’s well enjoyed. It’s pretty much the last remaining part of the Victorian seaside origins of Cleveleys that anyone can remember. The beach huts were removed when the seafront was redeveloped, the Orion Cinema/bingo hall was demolished to make way for the Aldi supermarket, and more besides. The shelter is a relatively small structure, in a spot where it’s doing no harm, and not a huge and costly, near derelict building with no practical alternatives. It’s also been suggested that it should become a listed building so that it is safe for the future. Comments also indicated that people would be prepared to contribute towards the repair of the shelter – with some suggestions of collecting buckets and fundraising campaigns, and others that people would be prepared to pitch in to contribute to the physical work. 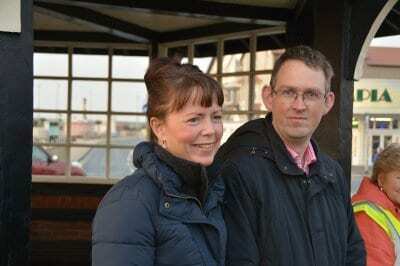 We’ve been in contact with Wyre Council who welcomed offers of help and suggestions to preserve the shelter. 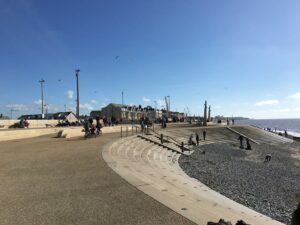 Unlike many other areas, Cleveleys doesn’t have a single community voice, but the main groups in town were all in agreement that they’d like to work together to get this asset restored. 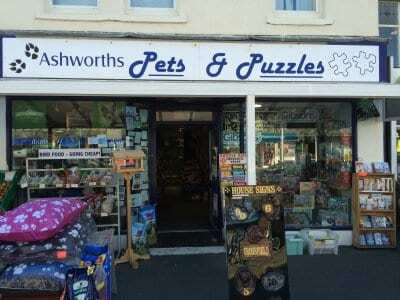 It’s brought the Thornton Cleveleys Past Facebook group, Association of Commerce and Trade, Rossall Beach Residents and Community Group and Cleveleys Community Centre together, along with help from Builders Supplies, to work as a team. This page documents the journey that we went on to see the shelter restored. The shelter had been repainted, re-roofed and cleaned up. Thanks to your generous donations and support, the four clocks in the top are now in full working order for the future. No one seems to know when this edifice was built, other than it’s going on for 100 years old. No one seems to know when three of the clocks went missing, or when the final one stopped. 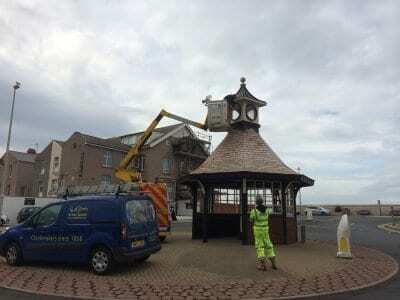 But now, a much loved Cleveleys landmark has been restored and maintained for the future, and it’s all thanks to the strength of our local community. Well done and thank you to everyone! Jane Littlewood and Paul Maynard MP who cut the ribbon and declared the project complete. The Manager at the Skipton Building Society had tipped us off that they run a community grant fund called Grassroots Giving. It provides £500 grants for local causes which are non-registered charities – just like the clock project. There were 161 pots of £500, and 304 shortlisted groups. We were delighted to discover that thanks to your votes, the Clock Shelter was one of the successful projects – which completed the fundraising target. Just one photo in this update. Clocks completed on 14 November 2014. Don’t need to add much else! Week commencing 10.11.14, scaffolding went up at the Shelter, to allow the top part to be painted and spruced up. This was in anticipation of Smiths of Derby coming to Cleveleys to fit the new clocks! The plan is to mark the achievement of everyone who has been involved in this community campaign, with an ‘opening event’ at Light Up a Life on Thursday 20 November. I’d like to say a BIG thank you to Keely Jones, the Estates Officer at Wyre Council (in the centre of this photo). She was such a big help in getting this work done, and in time to mark the completion of the project at our Christmas event. Along with the people and businesses who have donated money, I’d also like to thank my dad, Derek (below) for painting the clock shelter. 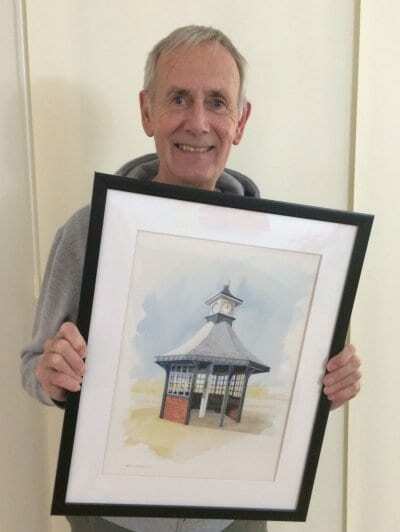 Here he is with the original painting of which prints were sold, which we’ll treasure for posterity! David Bannister from the Fylde Coast Wish Group on Facebook, who was a huge help with the fundraising. Margaret Hulme from Montpelier Accountants who was a star for banking the cheques and keeping hold of the cash raised. David Hewitt who produced this video as a momento for all of us of the opening event. A lovely clip to look back on in the future. If I’ve missed anyone off this list, huge apologies – just let me know! Wednesday 8 October 2014 saw work starting to the actual clocks in the clock shelter. The one remaining clock dial and all of the glass faces and bezels were removed from the shelter to be taken back to Smiths of Derby to be renovated and copied. Fortunately, the rainy weather that was promised managed to just about hold off until the work was completed and the pieces were safely in the van. About four weeks later the four new clock dials, glass faces and bezels were returned and replaced in the shelter to complete the restoration. We’d like to say a big thank you to Lancashire County Council engineering department for the loan of the cherry picker to provide access while the clocks were removed. An Afternoon of Clock Business! I’ve been in Cleveleys today on official clock business – and it’s been a really good afternoon too! First I started off by dropping clock prints off and saying thank you to the shop owners who have generously donated towards the fund last week. 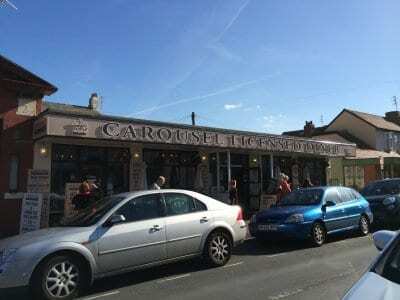 I’d been to Big Deal Clothing (above), Pets and Puzzles, the Carousel Cafe, Mickeys Bedding, Kay’s Fish and Chips and Steve’s Chippy, Masons Amusements, Cleveleys Kitchens and the Bookmark shop. They’re all listed in the donation roll call. Then I met with the Chief Executive and Leader of Wyre Council and some of the local Councillors who were out and about looking at the projects which the Shaping your Neighbourhood Funding has been allocated to. Of course our clock has received a £5000 grant. They were really pleased that everyone has been involved with and enjoyed taking part in this community project to restore and retain the last little bit of old Cleveleys. Back at the ranch, the very nice man with the cherry picker had said he would be able to come along and help out if it was OK with his boss, so I made a phone call to David Grassie (another very nice man) and we have lift off! Smiths of Derby, the clock company, are coming to site next Wednesday (8 Oct) to remove the one remaining clock face and start working on it. 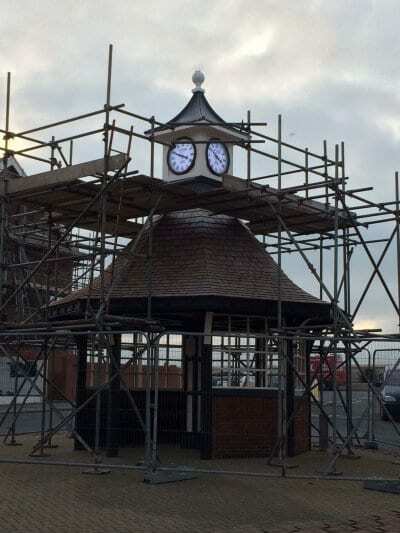 They will take it away to restore it and then four weeks later bring it and three copies back to be reinstated – Wyre Council are going to repair/repaint the shelter top/finial thing, and then once again the clocks will stand over Cleveleys to tell the time! Well done to everyone who has been involved. “I wish we could get to the fundraising target and get the clocks ticking”... be careful what you wish for because it might just come true! A week or so ago I made the acquaintance of the very kind hearted man who runs The Fylde Coast Wish Group on Facebook. He offered to help and yesterday lent a very welcome hand when he went out collecting in Cleveleys for the clock restoration campaign. The generous donations which he collected will be listed one by one in the tally as is customary. Well it’s been a good week on the clock fundraising campaign trail! It started with an email from Forsyths to say could I call in and replenish their stock of Clock Prints because they’d sold all the ones I left with them! So off I trundled to collect £200 from the sale of the first 20, and leave another batch – so if you haven’t got yours be quick because they are selling fast! I had to go to In Frame picture framers on St George’s Avenue and the lovely lady there bought one. Then I called at Fredericks where one exchanged hands for double it’s going rate and another £20 for the kitty! With £230 in an envelope I called at Montpelier Accountants to hand the cash over to be banked through the Chamber of Trade bank account, to discover Mrs Sadie Robinson had been in and left a cheque for £100! So all in all that finished Friday off exceptionally well. 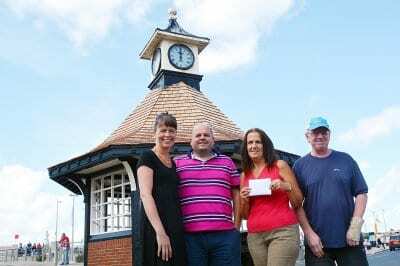 The Thornton Cleveleys Past Facebook Group donated a very generous £275 to the fund that’s aiming to see four working clock faces ticking again in the shelter on Cleveleys seafront. The Group, with almost 3000 members, enjoys finding and sharing photos and memories of the area in the past. They held their second get together event on Saturday, nominating the Clock fund as their chosen charity for the night. They join a number of other businesses and groups who have donated their time and money to see this iconic building restored to its former glory. 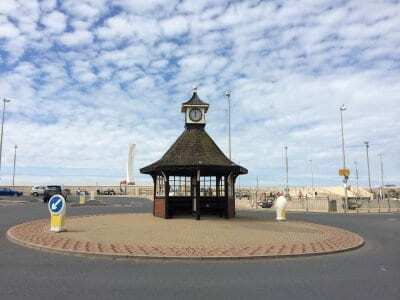 The Save our Clock Shelter Campaign was launched by Visit Cleveleys in the summer of 2014 and we’ve been overwhelmed by the support it’s received from you, the public, and the way that it’s brought the community together. It’s one of the last remaining pieces of original Cleveleys and it was clear right from the first photo showing the state it was in after the storms last winter, that people wanted to see it restored and preserved for the future. Many of the roof tiles had blown off, the paintwork was sandblasted and tatty. Along with the clocks which had been missing and not working for many years it looked generally unloved and captured everyone’s attention. 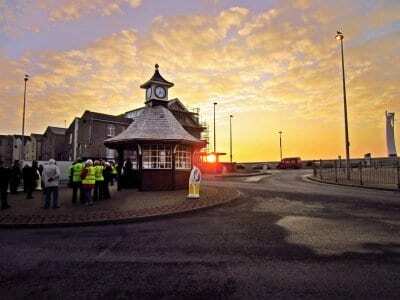 Several weeks into the campaign, Wyre Council had reroofed and painted it which made a massive transformation, and now the community is raising funds to get four working clocks ticking in the top again. 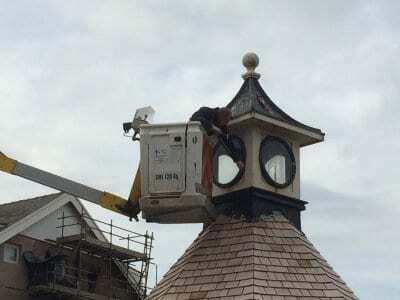 It will cost £8000 to reinstate the clocks as they would have looked in the early 1900’s when it was built. £5000 has been awarded from the Shaping your Neighbourhood Grant, with £3000 for us and the public still to raise. 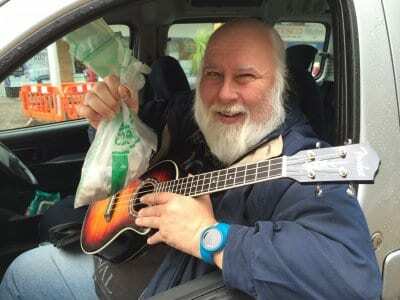 The campaign is going well, this latest donation brings the running total to almost £1500 with money having been received from some local businesses and many local individuals who wanted to help, including a huge bag of 20p pieces from Pete the busker! Manor Beach Primary School have also pledged to take a big role in the fundraising when school starts in September. 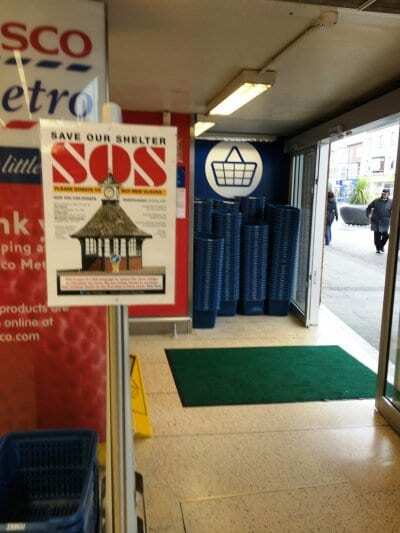 It’s been a busy week for the campaign to reinstate clocks in the shelter at Vic Rd West. At the Wyre Council Cabinet meeting the bid for £5000 from the Shaping your Neighbourhood community fund towards the £8000 cost of the clocks was considered and approved, so that is excellent news. One Friday morning we went collecting in Tesco. My friend and Rossall Beach Buddy Val came with me, and we had a good morning talking to people about what we were doing. Graham came and bought a print, and Pete swapped a huge bag of 20p pieces from busking for a clock print. I’d say that was a good deal for the clock! The Thornton Cleveleys Past Facebook group held their reunion last night, with proceeds towards the Clock campaign. I hope they had a great night, and whatever they raised is very welcome indeed. Wyre’s Cabinet is due to consider community projects worth £60,000 for towns and villages across the borough. The council’s Shaping Your Neighbourhood scheme was launched in 2012 to allow communities to be directly involved in improving their neighbourhoods. Over £400,000 has already been allocated towards an assortment of projects that benefit people throughout Wyre. A further £60,000 has been made available to extend the initiative; £10,000 for each of six neighbourhood areas that make up the borough. 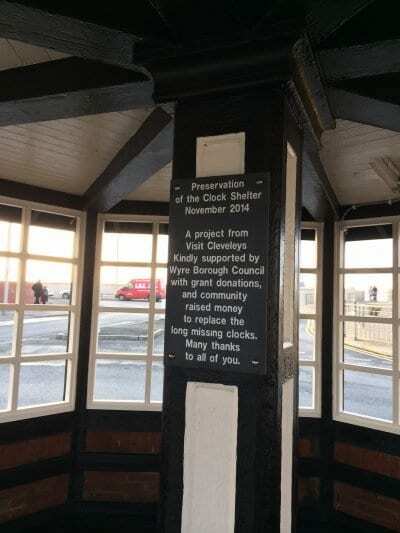 The clocks in our shelter at Cleveleys are just one of the projects set to be determined. A bid has been submitted for £5000 of the £8000 total cost – if successful this bid will cover the bulk of the cost, leaving the balance of funds to be raised by the community – which is why your help is so vital in completing this restoration. Shaping Your Neighbourhood is led by six Neighbourhood Lead Members who work across the areas to identify local issues and priorities that matter most to their communities. Lead Members have determined which projects are recommended for funding based on community consultation, sustainability and benefits they will bring. 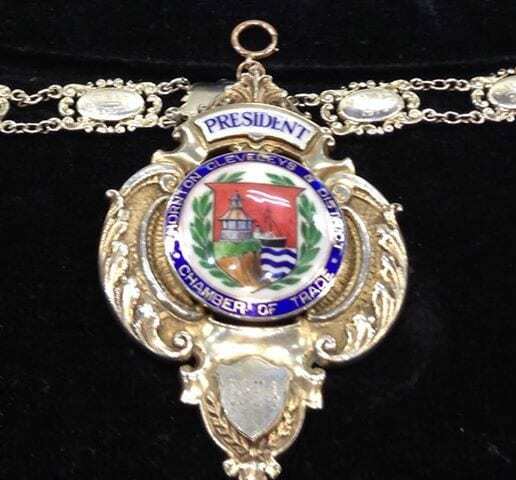 Wyre’s Cabinet will discuss the plans at a meeting on 30 July. I got quite a shock a week ago when I discovered that the shelter was being painted – a nice shock nonetheless. All thanks to my new surveyor friend Keely in the estates department at Wyre, who somehow had persuaded the powers that be to complete the renovation. Keely – we salute you! 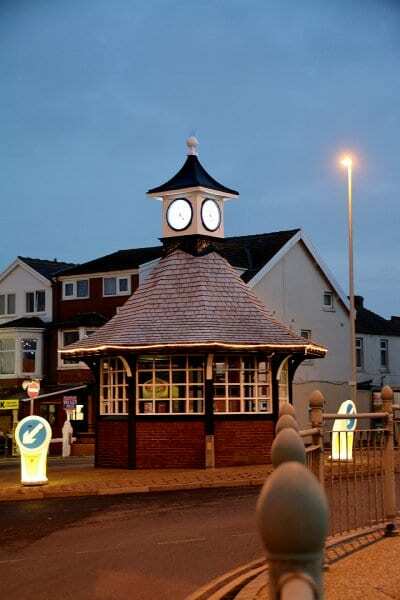 Our clock shelter is now looking loved and wanted again, and sets off the high street beautifully. Except for two things. The most obvious one I’ll come on to in a minute (the clock) but PLEASE will people take their rubbish over the road to the HUGE bin! Every time I drive past there’s litter on the floor – mainly from food and drinks. It’s wonderful to see people using it and sitting there to wait for buses, rest their legs, shelter from the rain, or even the baking heat we’ve recently enjoyed, but it isn’t a bin! When I went to take this picture I took a plastic bag with me and picked it all up, including the half full 2 litre pop bottle, and put it all in the bin over the road. So to the clock. If you’ve been following this story, you’ll know that the collective people of Cleveleys decided that they wanted the shelter looking after, and thanks to Wyre Council the serious damage from the storms of last winter has been repaired, which has left the clock housing looking, well, a shabby mess. You also wanted to reinstate four working clocks to the top. No one seems to know when three of them disappeared and the remaining one ceased up. We’ve established that it’s going to cost £8000 in total – a bid has been submitted to the Shaping your Neighbourhood Fund held by Wyre for £5000 and we are raising the rest. Donations to date are around the seven hundred odd mark, so that leaves at least £2000 to raise. 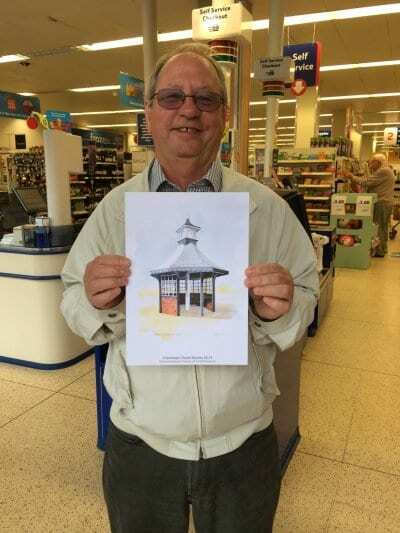 The Rossall Beach Group have planned to hold a collection day in Morrisons at Cleveleys at the end of August, and we’ve still got plenty of clock prints for you to buy. If any shops would like a collecting tin I’m more than happy to buy and provide them, all you have to do is get in touch. At the end of the day, this improvement makes Cleveleys a nicer place for people to come to, which means your business will benefit, so a tenner to the cause wouldn’t kill you, would it Mr Shopkeeper? The roofing contractor who Wyre Council have employed are well into the works to transform the dilapidated roof with it’s new shingles. Last week work started to strip the old wooden shingles and batons off. They were so rotten they just came away without the need for a hammer or crowbar. The roof was left felted and batoned for the weekend, and now the new shingles are being fitted. They should be completed by about the end of this week. Obviously this hasn’t been a cheap piece of restoration and re-roofing is all that the budget will stretch to, so discussions are ongoing regarding the repainting and rest of the structure, which is fortunately structurally sound. Tony from Smiths of Derby came to pay a call. 60 years ago they took over the William Potts company which provided the original clock almost 100 years ago. We’ve already had a budget price in advance of a proper estimate, and now that it’s been inspected we’ve received a detailed fixed quote of just under £8000. The existing clock and faces will be taken away – the remaining face will be restored and three new copies made. The housing turret will be cleaned up and then the clock replaced with a new, robust mechanism which will tell us the time for years to come. Smiths are generously carrying out the work at basic cost as a gesture of goodwill because it’s a community led project. They’ve also offered to replace the cracked finial ball with a new GRP one free of charge – with pointy things on top to stop our feathered friends perching there and plopping down the top! 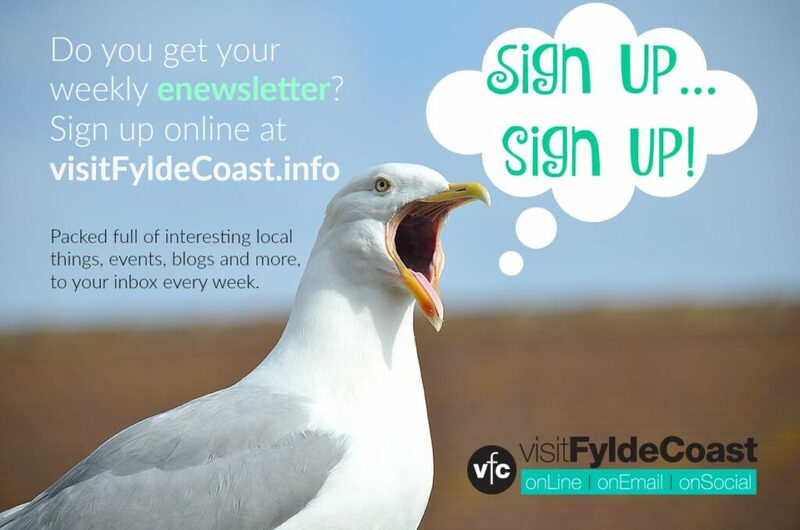 As reported previously, a bid has been submitted for £5,000 to the Wyre Council Shaping your Neighbourhood fund – we’ll know if this has been successful on 31 July. Now that we’ve received the quote we know the final cost to be £8,000 which leaves £3,000 for the community to raise. 1. Donate – with cash, cheques or by PayPal – details at the left. 2. Collect – we can provide a collecting tin for your business – please ask. 3. Fundraise – hold your own small fundraiser with the aim of reaching a small total – £25, £50, £100 – it all adds up. Apparently, several years ago when the hatch wasn’t locked shut, someone was actually living in the loft of the clock shelter. Someone spotted the guy one day and when they looked in the loft he’d got it kitted out as a home from home. A bit more folk lore to add to the story! 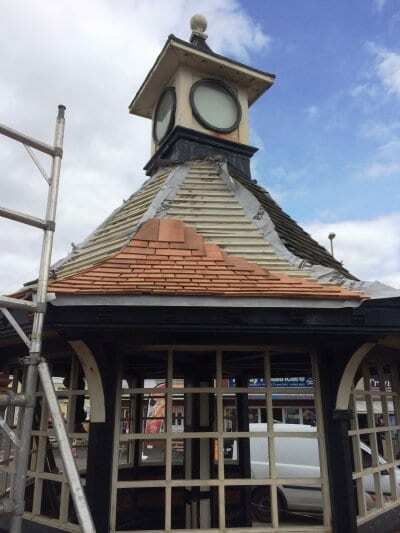 We’ve got some exciting news for everyone who has been right behind the Save our Clock Shelter Campaign – work is due to begin on the re-roofing, hopefully this week! 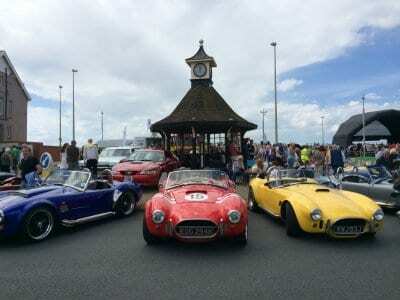 The clock shelter was modelling a bevvy of beauties at the car show this weekend! A building surveyor new to Wyre Council has been given the job of sorting it out as her first project. She’s a community minded individual who helps out in a similar way where she lives, and getting stuck right in she’s been really helpful in coordinating the offers of help and making sure that the project is sorted out in a logical way. We met last week and heard that all the old shingles are coming off the roof, which will be refelted and new batons fastened before being re-roofed in new timber shingles. So not only will it look fine and dandy, it will also be structurally sound for at least the next 25 years. There’s a bit of damage to some of the fascias at the roof line, which will also be sorted out when the roof is done – it will all be carried out from a mobile platform and take a couple of weeks to complete. Next up we are waiting for an inspection by the clock company and a firm quote on the actual clock part – but it doesn’t stop us from raising money int he meanwhile! A £5000 bid has been submitted to Wyre Council for the restoration of the clocks in the shelter, from the Shaping Your Neighbourhood project. It’s a new approach to involving people and communities in identifying issues, priorities and solutions within their neighbourhoods. Elected members of the council are providing the link between communities and the council, led by six neighbourhood lead members who are coordinating overall activity in their areas. If unsuccessful, we’ll hear by the middle to end of June. Applications for consideration go to the Council Cabinet meeting on 30 July, with successful awards being informed on 31 July. Right folks, hold your nose and take a deep breath, we’ve got a price back for the restoration of the clock on top of the clock shelter, so the fundraising can begin! This is only a budget price at this stage – provided from photographs until the clock company can come to site and do a proper inspection – so a proper firm quotation will be available then. Restoration of the four clocks will cost anything up to £10,000 – so that dream I had a few weeks ago wasn’t far off at the lower end of the prices I imagined! Wyre Council run a local funding project called Shaping your Neighbourhood, which gives local groups the opportunity to bid for a £10,000 pot of money for their area. 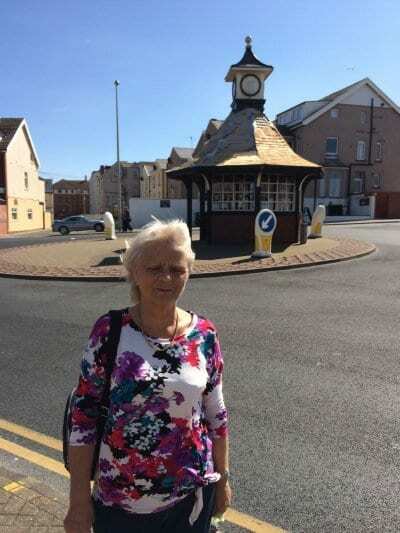 Cllr Andrea Kay is the coordinator for Thornton Cleveleys and has told us to apply for £5,000 from that funding pot, so the total required isn’t as bad as it sounds – assuming of course that the money is granted. Not a lot to report today, as we’re continuing to pursue a price for the restoration of the clock itself. In anticipation, we’re sorting out the mechanics of how a fundraising campaign would be managed. Cleveleys Chamber of Trade have very generously offered to collect and bank donations through their bank account. Montpelier Accountants, who look after their books, will be responsible for tallying up the donations and doing the banking. The Venue have kindly agreed to be Post Office Central for any donations sent through the post, and you’ll be able to drop cash donations off there too. We’re hoping they’ll need a big holding box to cope with the influx!! 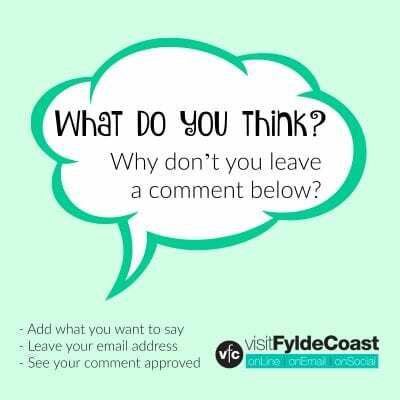 We’ve had the question of glazing the windows out to public consultation on Facebook, and people overwhelmingly agree that it would be wonderful to take up the kind offer from Northern Express Glass of glazing the structure once again. Meanwhile, last week, the Gazette were in touch and ran a piece about the campaign (pictured). We also did an interview for BBC Radio Lancashire who contrasted the 120th birthday of Blackpool Tower with our own little tower. Steve Becker, the then lovely reporter for BBC Radio Lancashire, also informed me that the interview had been put forward into a programme which runs nationally. So our little shelter and community campaign had a bit of national recognition at the weekend! Good news! We’ve just been talking to Wyre Council and they are coming to repair the roof shortly! Well they said in the next couple of weeks so it should be quite soon. BIG thanks though to Jake Eley the roofer who very generously offered to do the work for free in the first place. We’ll be chasing up the clock company next and trying to find out how much it’s going to cost to sort out the clock, and then launching a fundraising campaign for a truely community spirited venture, dedicated to the lovely people of Cleveleys! But first, does anyone know if there were four working clocks at the top of the tower? There are faces clearly visible in the old photos, but the engineer at the council thinks they might have been painted in, and there isn’t any evidence of the other mechanism. Can anyone answer that particular conundrum? Next question. Do you think the windows should be glazed or not? We went for a close-up look, and you can’t tell on this pic but the inside of the clock shelter is like the fire-back (as we would have said in Yorkshire) from the wind, sand and dirt that’s blown in. Glass would solve that problem and make it look more attractive – and it does look to have been glazed in the past. What does everyone think before we have another chat with the very generous Northern Express Glass who offered to glaze it as a community contribution? Jake Eley the roofer has been to have a look and says that the rest of the roof is OK and the missing tiles can be replaced. He’s given an estimate of how many wooden shingles will be needed – apparently you paint them a mucky colour so that they blend in when replaced. Builders Supplies had already pledged their help, and we’ve asked them about providing the missing materials and shingles for the roof. West Lancashire Electrical Contractors are going to have a look at whether it’s feasible to put a light in the top to deter those who might like to congregate there and get up to mischief. There must be power to the island as there’s an illuminated bollard next to it. Although I wonder if the power to the clock was cut off when the new roundabout was built? We shall see. Parkinson’s building contractors are going to come and have a look at the shelter with a view to helping with the decorating. I’ve tracked down the clock repair company and just emailed them for comments. Let’s see what the clock bit might cost (eek!) Then we can start a fundraising campaign when we know what’s what. I’m expecting the clock to be an expensive exercise, which will be where the fundraising comes in, so watch this space. Several people have already offered pledges and to help, but it makes sense to know what it will cost first – or even if it’s possible.  I even received a £250 pledge this morning from a business in Cleveleys. Once again we’d like to sincerely thank everyone who has offered to help, provided photos and shown an interest and to say once again that it’s heart warming to see everyone rallying round and working together to help our little edifice! So where are we at. Well first of all we were overwhelmed by the support and interest our little clock shelter has created, it seems we’re all of a mind to look after it for the future. It’s been a bit of planning by public conversation, so we’ve now got a lead or two to follow up which might tell us what needs doing with the clocks and how much it will cost, which will tell us how much we need to raise. A very generous roofer called Jake Eley made contact via Andy who admins Thornton Cleveleys Past, to say that he would donate free labour to repair the roof. We’ve also been in discussion with people who are going to look at the rest of the repairs. Others have offered to do some public fundraising, while a number of people have asked about making a donation. Can anyone provide information about the clocks? Can they be repaired? Where can we get new ones from? How much will it cost? Establishing a cost for the clocks seems to be a logical place to start, so we’re looking for a ‘clock-ologist’. If you know one, send them our way! At this stage we’re sticking a finger in the air to see what comes forth. If there’s an appetite for people to donate time, materials and money towards the renovation then that’s what we will collectively try to arrange. I’m not a building surveyor, but at a glance I’d say that the services of a painter and decorator are required and maybe a carpenter, along with a roofer, new shingles for the roof, and potentially a considerable piece of work on the clock – or maybe even the requirement for a new one. It was suggested that a fundraising campaign could homour people who donate money by putting their names under the shingles – so that could be investigated. If tradesmen are generous enough to donate time and materials it would be nice to unveil a commemorative plaque at the end of the project to thank everyone for their help. Of course there will be publicity for anyone who does contribute. If works are carried out on the shelter, as you would expect, anyone involved will have to comply with Wyre Council’s requirements in terms of insurance, public safety, risk assessments etc. Have you got any old photos of that spot as it once was, and photos of the shelter from it’s own origins? Have you got memories of the shelter when you were little? From day trips or maybe from climbing into the rafters as someone said. Take a look back through the history of the clock shelter, with lots of photos from throughout the years. We want to hear it all, so that we don’t just preserve the shelter as it stands for tomorrow, but also collect and preserve it’s past too. Our project was successful with the £500 from the Skipton – which takes the total far enough over £3000 to pay for the fairy lights and a few odds and ends. Perfect accounting! John Byrne from JT Byrne Funeral Directors, has very kindly paid for a slate plaque (above) to mark the completion of the project and the restoration of the clocks and the shelter, thanking all the wonderful people in our community for what they’ve achieved this year. Masons Amusements have also handed a cheque to our helper from the Fylde Coast Wish Group, this time for a very welcome £200. Drum roll and fanfare, this makes the total for now £2548 – which means that if we get enough votes for the £500 from the Skipton, WE’RE THERE!!! Another lovely cheque for £100 from Mickeys Bedding Shop on the corner (and might I add it looks very nice for it’s recent building work too). 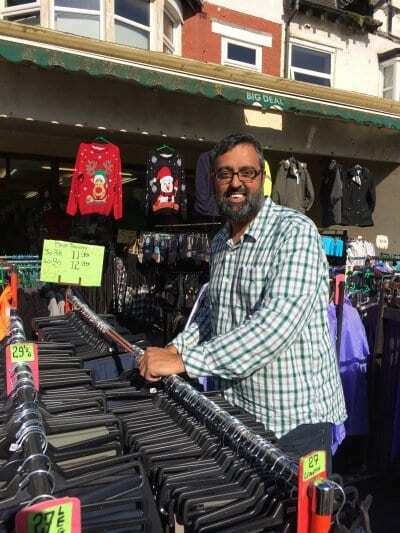 The very kind owner of the two Big Deal clothing shops (one on each side of the road) has given a very nice cheque to the fund for £100. 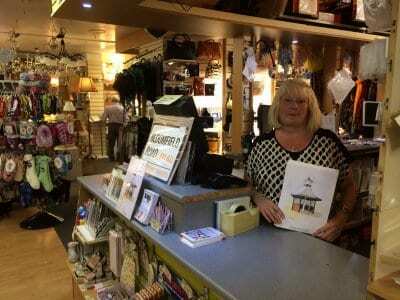 20 prints sold by Forsyths at Cleveleys adds another £200 to the fund… they’ve got another batch so get yours quickly! Fredericks have bought a clock print and doubled their money to £20! The Thornton Cleveleys Past Facebook Group have been helping the clock fund. 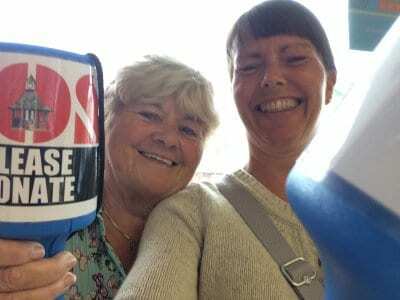 They held a get together event in August and raised a whopping £275. A big thanks to the organisers and to everyone who went along and supported the event. You’re wonderful! Pete Skinner – swapped a very heavy bag of 20p pieces from previous busking for a clock print. That was a very good deal for the clock because there was £80 in it. Thanks Pete and lovely to meet you too! Northern Express Glass – generously donated £150 – thamks guys! Claire Hawco – £10 clock print all the way to Canada! Erica McNaughton made a second very generous cash donation of £10 when she spotted us in the supermarket one day! Builders Supplies (West Coast) Ltd have made a very generous donation of £100 towards the fund. Erica McNaughton has donated £10 – she was the first person to offer a donation when we started talking about this campaign. 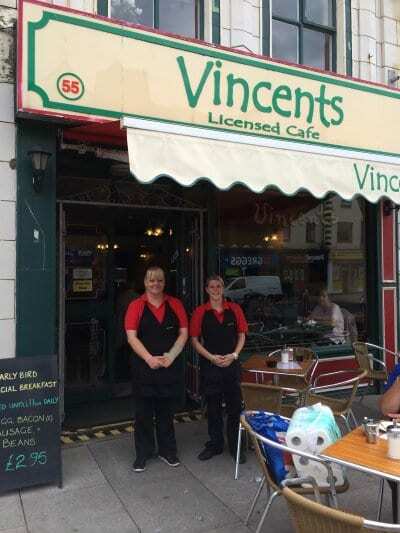 The lovely people at Vincents Café have made a £100 donation to the Clock fund. We’ve said it before and we’ll say it again. Our little clock shelter has really captured the imagination of the public and brought the community together in a really heartwarming way. It’s been good to have everyone involved who wants to be through the online campaign and using Facebook to give everyone a voice. In the absence of a Town Council or general group for the whole of Cleveleys it’s been nice for everyone to be able to work together as one. We want to keep that momentum and feeling of community pride going. We started a new Event tab on the Visit Cleveleys Facebook page – find it here – to make a sort of guest book where donations will be listed individually as they come in, so that everyone gets recognition for the part which they play. It doesn’t matter how much you send, whether it’s £2 or £200 it all adds up and please don’t feel that you have to give a certain amount to keep up with the Jones’s. It’s not a competition to see who can donate what – it’s the thought that matters. If you want your donation to be anonymous please say so. If you have a comment to add to your donation please include it and we’ll post it with your entry. Whatever happens, you can be assured that everything which we can control will be up for public agreement – this has been a transparent public process from the start and it will continue to be that to the end, when we’re stood under the clock shelter cutting a ribbon and declaring it finished! Let’s say that we get absolutely flooded with cash and raise four times more than we need, then the floor will be opened up to another public discussion to decide what you want to do with the money. If this happens, we’ll put the brakes on banking when we get to the required amount so that we can cancel/destroy cheques and hand cash donations back (which is why we want you to include your details). We’ll ask you what you want to do with any surplus donations – do you want to start another local public project and put it towards that, or pay the cash to another local charity (Trinity or the RNLI etc). Northern Express Glass have offered to supply the glass and a glazier to fit new windows, free of charge as a community project. West Lancashire Electrical have offered to fit a new light into the ceiling. Jake C. Eley has very generously been in touch to offer free labour for the roof repairs. Steve from Birmingham comes to Cleveleys and Blackpool frequently, and he’s kindly offered to make a donation to the cause. 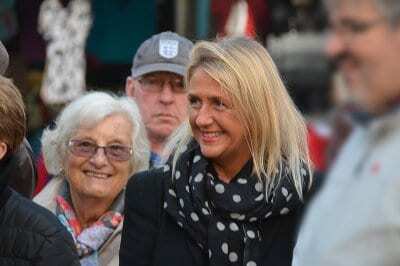 Kevin Howell said all the ‘Likers’ of Visit Cleveleys could donate £2. That would be a start. Probably enough to bring it to its former glory. 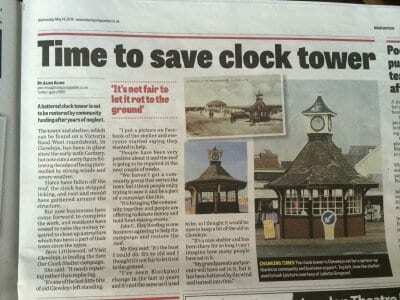 Maria Potter sent this photo in (above) and said “So sad to here about the clock shelter. I took a beautiful photograph Christmas week 2013, when I ran through the town taking shot after shot in the glorious pink ridden sky. The clock shelter was the most magnificent sight, it looked like a dancing lady. Hope the picture can inspire some people to save the shelter and return it to its former glory, the shelter may be small but it is a beautiful architecture. I wrote a poem, the scene was just to good to waste. I included the poem just in case but in this case I think the picture mat tell the story better. What lines the sky with such reward? And Tango with the sleepy sun. Put to rest the weary heads. And skip and jump and skate and run. Like lovers in romantic flight. In an elegant Waltz of complicity.